If you’re a libertarian, chances are you find yourself bombarded with objections, or feeling compelled to respond to the barrage of uncomprehending criticism your friends are sharing on social media. Conservatives badger you about war, drugs, even liberty itself, and left-liberals demand to know why you don’t favor redistribution and a Scandinavian welfare state. I have two suggestions for you, and they both involve new books by Tom Woods. 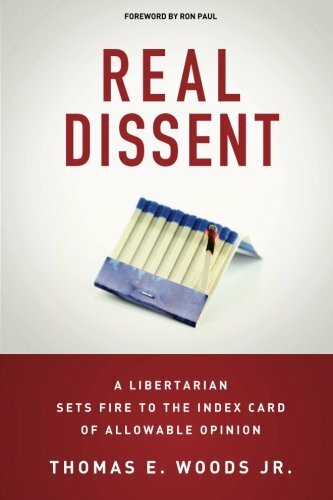 More important is Tom’s first print book in nearly four years: Real Dissent: A Libertarian Sets Fire to the Index Card of Allowable Opinion. Tom tells me it’s his favorite of the dozen books he’s written. Tom’s premise is that there is very little real dissent in the United States, where the confines of what the political and media classes have declared to be allowable opinion are extremely narrow. The bipartisan foreign-policy consensus is a good example: you can favor somewhat more or somewhat less foreign intervention, or you may criticize the precise form that a particular intervention takes, but you may not reject the overall framework root and branch, or even raise fundamental questions about it. Should you stray from these boundaries of opinion, you will simply be excluded from the discussion, and likely smeared and vilified to boot. 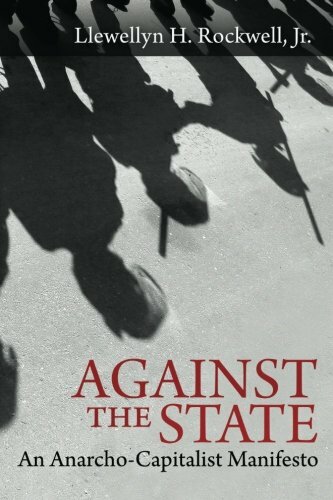 The rest of the book is an all-out assault on establishment opinion. The key step for Tom, as for any convert away from neoconservatism, involved taking a second look at war and the military. Real Dissent begins with a bang as Tom describes his evolution from neoconservatism to libertarianism, in an especially frank and personal chapter called “I Was Fooled by the War-Makers.” He reflexively supported the Persian Gulf War of 1991, since that’s what conservatives did, but had trouble joining in the general chorus of cheers and Bob Hope specials as thousands of strangers were mourning the deaths of spouses and children. Two years later he discovered the work of Rothbard, and never looked back. It might have been strategically easier for Tom to start Real Dissent with Part II, in which he dismantles some of the most common criticisms of the free market. 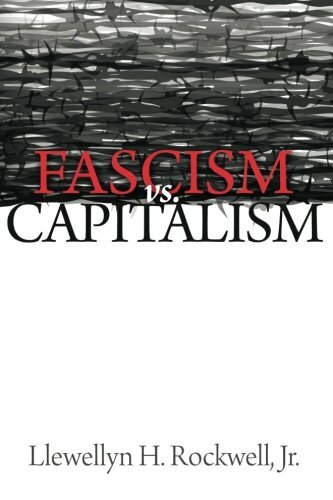 But he made the deliberate choice to begin the book with a Fascism versus Capitalism Llewellyn H. Rockwell Jr. Best Price: $6.00 Buy New $9.00 (as of 09:45 EDT - Details) section on war and foreign policy. Having been misled into supporting what he now knows to be wrong, Tom is determined to draw others out of the same mistakes. If you’ve been wondering how you’re ever going to reach that conservative in your life, you’ll find this first part of Real Dissent especially useful and compelling. The section of Real Dissent that I suspect many readers will skip ahead to, because it’s their favorite flavor of Tom’s work, is Part III, “Libertarianism Attacked, and My Replies.” The number of uncomprehending but high-profile attacks on libertarianism, whether in the New York Times, Salon, Slate, or other outlets of fashionable opinion, has grown in proportion to the explosion of interest in libertarian ideas ever since Ron Paul grabbed the public’s attention in 2007. And as LRC readers may recall, Tom came to specialize in responses to attacks like these, and proceeded to dismantle them one by one. Part III of Real Dissent gathers these replies into one place. You’ll cheer as you read them: not just because they’re full of arguments and evidence you can use in your own debates, but also because it’s a unique pleasure to watch the arguments of hostile critics – not simply confused people of good will – systematically exploded, with knowledge and humor. In chapter after relentless chapter, Tom takes on some of the objections that libertarians are most likely to encounter in social media: the free market leads to “monopoly,” higher taxes on the “rich” produced greater prosperity, the American economy has been more stable since the creation of the Federal Reserve, and so on. To whet your appetite, I’ve thus far mentioned four parts of Real Dissent. But there are six more. It is a tour de force. When Murray Rothbard met Tom over 20 years ago, he knew Tom was destined to be a star. I remember seeing them chatting away at our Mises University event one night – and then, when I returned hours later, there they still were, talking a mile a minute. It was a great moment for Tom, who has worked to advance Rothbard’s intellectual project ever since. If you read Real Dissent, you will emerge more knowledgeable and a better debater. That’s for starters. But your intellectual pleasure will be multiplied by Tom’s elegant and devastating prose, and by watching one of our most skilled and prolific libertarians take apart our most vicious critics, almost effortlessly. During my presidential campaigns, Tom Woods wrote some of the most effective replies to some of my unkindest critics. Whenever a popular Internet site would run an article with a title like “Ron Paul’s 15 Most Extreme Positions,” I knew Tom was on the case…. Tom and I have worked together closely over the years. I asked him to write the Mission Statement and Statement of Principles for Campaign for Liberty, the organization I founded after the 2008 campaign. I invited him to testify before Congress about auditing the Federal Reserve. I’ve invited him to be the opening speaker for me on many occasions, and he spoke at our great Rally for the Republic in 2008. Today, Tom is doing some of his most important work of all, because of the lasting impact it will surely have: he’s designing courses for the Ron Paul Curriculum, my K-12 homeschool program. The book you hold in your hands is great fun to read, but also filled with useful debating points that will come in handy as you make the case for the free society with friends and family. 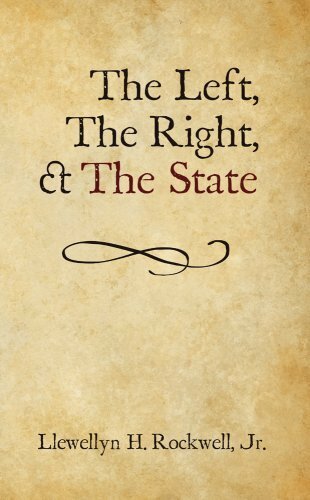 In endorsing one of Tom’s previous books I called him one of the libertarian movement’s brightest and most prolific scholars, and I am delighted to commend his new book to you. You will enjoy it, and profit from it. Listen to Ron. Read Real Dissent.